What is the next step for Hyundai's N division? After the exciting unveiling of Hyundai's fiery i30 N, we wonder what other hot models the South Korean brand has up its sleeve. With most manufacturers introducing sporty versions of their SUVs, we wanted to know if Hyundai would use its new 'N' performance division to do the same. Chief operating officer of Hyundai Europe Thomas Schmid said: "In the future, SUVs may even have this high-performance feeling and power – perhaps with the Kona. "The challenge for us is that if you look into the SUV market, regardless of which segment, they are all growing and all conventional segments are slightly decreasing. This means there is a shift in the market from conventional segments to SUVs, which means that there will probably be a requirement for high performance SUVs." He went on to explain that although sibling company Kia is bringing out a sporty V6 version of its new Stinger saloon, Hyundai has no plans on competing against it. Schmid said: "We don't really compare ourselves with Kia, we have different strategies. Hyundai is probably the more mature and upgraded brand and Kia the sportier one. "I don't see the Stinger as a competitor to N, Kia wants to underlie its sporty position. We have created N to emotionalise the brand, we have been missing emotion – Hyundai has excellent quality and design, but lacked emotion." 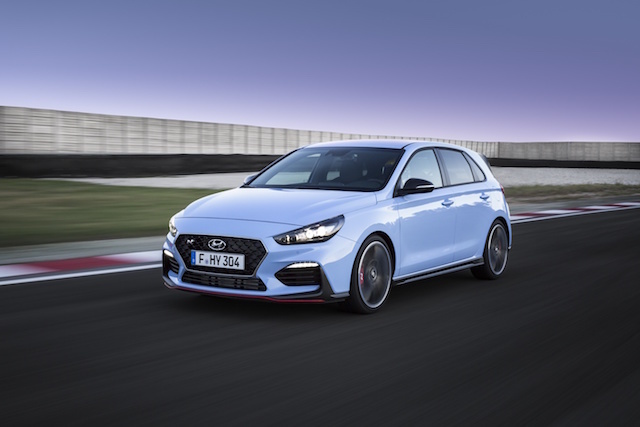 Alongside the i30 N, a new i30 Fastback was also released. When asked about this also being turned into an 'N' car, Schmid didn't rule out anything, saying: "It is under consideration. We will make cars if there is a demand for them, as we would with the I30 Tourer."